Do you support the GBC VRC and its mission? They need your votes! 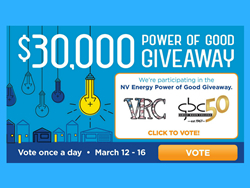 The Great Basin College Veterans Resource Center has entered for a chance to win $15,000 in the NV Energy Power of Good Giveaway. The program supporting veterans and active members of the military with the most votes WINS!! Vote once per day, TODAY through March 16, for the GBC VRC! Winners will be announced no later than March 21.